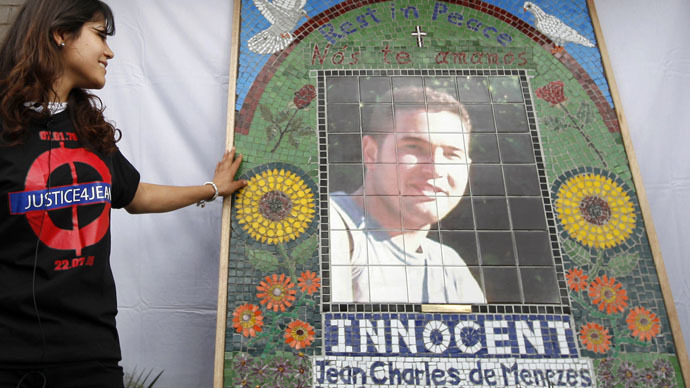 The case of Jean Charles de Menezes, who was repeatedly shot in the head by police at a London tube station in the wake of the July 7, 2005 bombings, an incident for which no officer was prosecuted, will be heard at the European Court of Human Rights. De Menezes, a 27-year-old Brazilian electrician, was pinned to a seat by an officer and shot in the head by two other policemen at point blank range, police say, after being mistaken for a terrorist. The case is to be heard next week in the upper chambers of the European Court of Human Rights in Strasbourg, France. Ten years on from the killing, the court will review the decision of the Crown Prosecution Service (CPS) not to charge any of the officers involved in the killing. In December 2008, an inquest jury rejected the official version of the shooting, recording an open verdict. No charges were brought against the officers involved. The case is being brought by Patricia Armani da Silva, De Menezes’ cousin who was living with him at the time. An application to judicially review the decision not to charge the officers has already been rejected by the UK courts. De Menezes’ family maintains the use of lethal force was unnecessary, because of a lack of evidence that the victim presented a threat. “The killing of Jean Charles de Menezes, a totally innocent man who was given no chance to surrender before being shot nine times in the head, caused great public concern, as has the fact that no officer was prosecuted or even disciplined for any [offense] arising from the tragic circumstances surrounding his death,” Wistrich said. “The failure to hold any individual to account in relation Jean Charles’s killing and the unlawful killings of other members of the public has arguably led to a crisis in confidence that state agents in the UK who abuse their power will not be held to account,” she added. The killing took place on July 22, 2005, a fortnight after the 7/7 London bombings that killed 52 people.